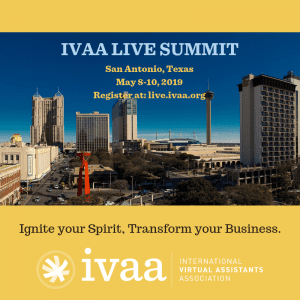 Annually, the International Virtual Assistants Association has annually hosted online conferences for its members and Virtual Assistants worldwide each fall. The Online Conferences (called Online Summits) are designed to provide a day long conference with educational opportunities for both new and experienced Virtual Assistants, and networking with fellow colleagues. It is a great way to leverage time and learn online – each session will cost you approximately $3 per session. Where else can you get training / workshops to help guide and grow your virtual assistant business at this price? How Are Online Summits Held? IVAA uses GoToWebinar platform to deliver video and audio presentations right to your desktop. Requiring a high speed internet service to see and hear sessions, you can either use your computer headset or call in from the many international numbers to hear and ask questions. Video is streamed live, no downloading of PDFs, Powerpoints or other material is necessary.